Laura opened Westside Pilates in 2006. Her goal was to create a warm and inviting environment where people could get fit, feel good and reduce or eliminate chronic pain. She has high energy and a positive, caring attitude that she brings to the studio and her clients. Laura discovered her love for Pilates in 2000. She has always been passionate about fitness and healthy living, but she was amazed at how Pilates brought all of that together. Pilates treated her running injuries quickly and easily. It also gave her a greater sense of body connection, core strength and proper alignment. Laura found that she felt better and could perform better when she was doing pilates. Laura began an apprenticeship at Pacific NorthWest Pilates in Portland OR in 2005. She gained valuable insight,teaching principles, methods and inspiration. Laura became certified in STOTT PILATES® mat and reformer in 2006. Laura continues to take courses to challenge herself and her clients with new ideas, and is always looking to learn more. 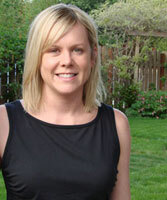 She has taken the STOTT rehab courses twice, Advanced Refomer and Mat, Myofasial and M.E.L.T classes. She became Booty Barre certified in 2012 at the training center in Woodinville, WA. Laura has a B.A. from Western Washington University and a Masters Degree from Washington State University. Laura enjoys working with clients of all fitness levels. She likes seeing her clients progress, gain a mind body connection and live pain free. When Laura isn’t at the studio, you will find her enjoying life with her husband and daughter. They love to go to the beach, hikes and bike rides.